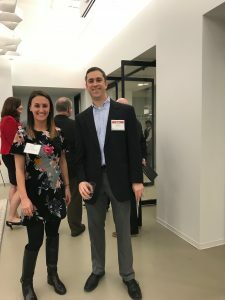 On the unusually balmy evening of February 5th, AEF held a Kick Off Reception in new space managed by JLL at 2020 K Street. More than 35 industry executives had the opportunity to learn about the Foundation’s mission and priorities, and discuss hiring challenges directly with AEF staff. BOMA International. The Foundation has applied for numerous government and private sector grants, and is seeking additional support from area property management firms and vendors. Pictured above are: (left to right): David Ferrara, Lincoln Property Company; Andy Abell, Bill Clark and Matt Slocum, all with Blake Real Estate.